From BFF’s, “bromances” to finding “the one,” millions of relationships have been formed over the years on any given Contiki adventure. And putting the “group” back in “group travel,” Contiki has launched a new, fun and engaging campaign that encourages clients to travel together and form new bonds with other millennials from around the world. 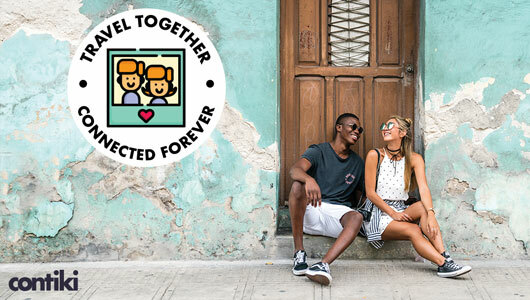 Entitled, “Travel Together, Connected Forever,” Canadians are reminded about the fact that travel is an experience best shared – especially with a group of best friends or a romantic partner. Founded on the belief that we are all connected and in it together – despite oftentimes feeling like the world is incomprehensibly huge – for over 55 years, Contiki’s core ethos has always been and continues to be about connecting young people with not only the best time of their lives, but also with each other. To encourage young Canadians to secure their seat beside their friends or even a not-yet-discovered new “bestie,” Contiki is offering up to $670 off its Europe trips if booked and paid in full by April 10. Canadians travelling as a “squad” can save an additional 5% if they bring four of their best friends, 7.5% if they have seven in their group or 10% off if 10 people join (or the 11th traveller goes free). Nearly 20 of Contiki’s most popular trips are highlighted in the campaign and span the world – with an additional 25% off on select trips to Europe. They include: Simply Italy; Spanish Spree; European Highlights; Eastern Road; Greek Island Hopping; Italian Bellissimo; Asian Adventure; Thai Island Hopper East; Vietnam Experience; Pura Vida; Inca Panorama; Andes and Amazon Highlights; Beaches & Reefs; Kiwiana Panorama; and The Big Tiki.